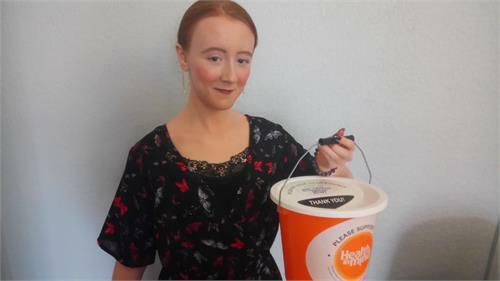 I’m Iona and I’ve been volunteering for Health In Mind for about six months. I usually volunteer in the office to gain administration and business skills while I’m looking for a job but I also help out at collections. I started volunteering with Health in Mind as raising awareness for mental health is something I’m passionate about. My own mental health is not always the best and I know that without a positive outlook on life, you don’t have much of a life. I have been to a few bucket collections now where I packed bags, handed out leaflets and took donations from members of the public. Sometimes people tell me about their own experiences about Health in Mind’s services, their family or events happening during their day. This was interesting and occasionally made me laugh, especially when people pass on funny stories! I've also had people mention that Health in Mind had got them to a better place, which was touching to hear. Collections offer time to engage with local people and a good chance to boost the reputation of Health in Mind and you never know, perhaps someone struggling may see us and go on to use one of the services. I would definitely recommend volunteering with Health in Mind as everyone has their own mental health experiences. Volunteering is a great way to have a direct impact on the community around you and maybe meet some new people that you wouldn’t have crossed paths with otherwise.